It’s very inspiring to hear about people who dedicate their lives to helping others that are less fortunate than themselves. Cristina Corales is one of these selfless individuals who has dedicated her life helping the worst of the worst street dogs in Puerto Maldonado in the Amazon. 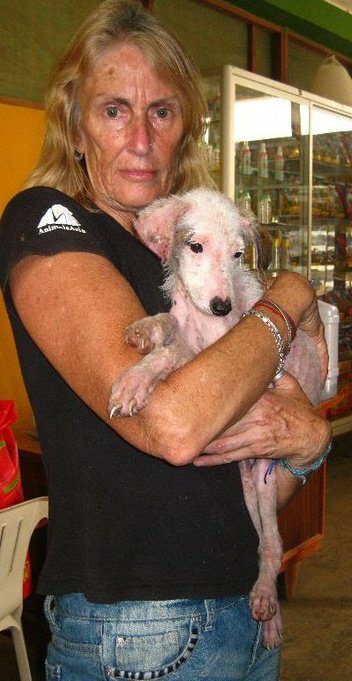 It is here in Peru that Cristina works alone and self-funded to give these sick, starving, mange-covered street dogs a second chance at life. The photos of these animals are absolutely heartbreaking and thanks to Cristina a number of them have managed to regain their health once again. I had a chat with Cristina to find out about her work in Peru and the challenges she faces along the way. How long have you been helping sick street dogs in Peru? 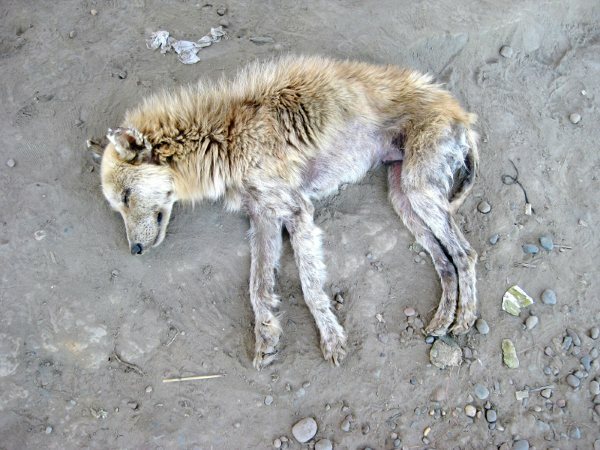 I first saw a dog in an extremely bad state when I was visiting Peru in May last year. She was so thin I wondered how she could still be alive. When I fed her she raised her head off the filthy ground and looked me straight in the eye, it was then that I promised her I would come back and find her again. So I returned in July last year and found Rosa as I had named her. I then noticed other dogs coming forward each day I fed Rosa. It just sort of grew from there; I can't turn away from a starving or sick dog and hope to be here for another year or more. What inspired you to begin your work? I lived in Mexico on and off for about 5 years, the dogs there are in need of help but I was never in a position to do anything for them. So when I saw Rosa something in her eyes just told me that this time I'm not going to ignore the suffering any more. She was living in a truck parking area; a place I discovered was a favourite dumping area for sick or unwanted dogs. I have cleared the area of dogs, then I go back there once a month or so and find it has filled up again. My last rescue from there was Solita, a poor little girl with one broken leg, the other leg had a huge ulcer covered in insects, and as she was unable to move round quickly she was also starving. To be a successful street dog they must be quick on their feet, pushy and a bit aggressive. Solita has none of these attributes so she got no food. Oh, where to start? Probably the day I brought home a dog that started showing signs of Rabies! But apart from that, as Revolution and other parasite control products aren't available in the town where I live, getting rid of mange has been an ongoing struggle. Very antiquated methods are still in use, such as purging to get rid of worms, but with mange the dogs were re-infecting each other all the time. Some people here treat mange by bathing their dogs in petrol; others inject them with a cattle product which burns the dog as it's injected, so I wouldn't use that. 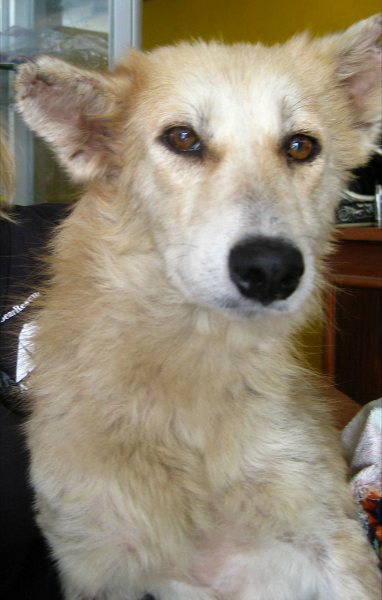 Rosa, before she was rescued. What do you believe needs to be done to help the future of these dogs? If the municipality had their way all the street dogs would be fed poison. It is only after urgent meetings with the Ministry for the Environment that they have agreed not to kill the hundreds of dogs if I can come up with an alternative plan. This year, thanks to an animal welfare group in the USA, 24 vet students are coming to Puerto Maldonado to start a spay/neuter program. After that it will be up to me to do follow-ups on the health and feeding of the dogs and to try to get people to see that having a dog means more than just throwing him/her scraps once a day. I would also like to thank VetShop for the very generous donation of products, and for the discount they gave me towards my mission of saving these helpless dogs' lives. We wish Cristina all the best in helping the homeless dogs of Peru and think the work she is doing is truly inspiring!